Ready or not, Cars 3 has arrived. But before we head down that road, let me back up and detail my thoughts on the first two films. The original film has an I believe undeserved reputation of not being one of Pixar’s best. While technically true, that’s solely down to the fact that Pixar put out such high-quality work. Any other animation studio would have loved to be working at the level Cars was at. But compared to the Pixar’s other offerings, the film suffered in comparison. 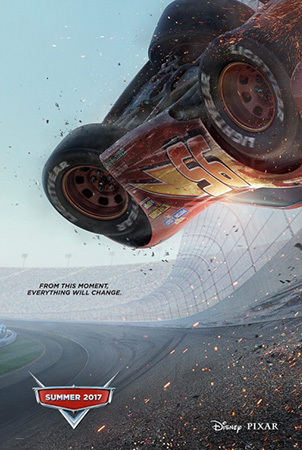 What I absolutely loved about Cars was the way it completely subverted my expectations. 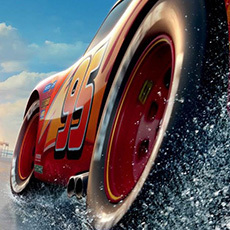 An animated movie about car racing? It’s going to be loud, fast-paced, and less focused on story, right? Nope. It was such an unexpected pleasure to be watching an animated film that literally took the time to take its time. Back in the Shrek obsessed mid-2000s when animated films were falling over themselves to tell cool stories at breakneck speed with the hippest jokes and the best pop-culture references, Cars took the road less traveled. Then along came Cars 2 which threw what made the first movie so good out the window. Don’t get me wrong. It was a pretty good animated film, but it was a terrible Cars movie. Take the same basic plot and get it out of the Cars universe and you’d have something that’d probably be a nice hit for some other animation studio. But the dissonance between Cars 2 and its predecessor was intolerable. So that brings us the third installment of the franchise. Is this one stuck in a rut, best in class, or somewhere between? Before I get into any details about the film, we need to acknowledge the Elfin in the room. Cars 3 is to Cars as The Force Awakens is to A New Hope. Both films share a similar plot and have the same story beats as their originals. And there are a lot of callbacks and reminders from the first films. But in the end, you’re just happy they copied the right movie in the series and not the more recent episode. Yes, structurally speaking Cars 3 takes the chassis from Cars and changes the body a bit. We start out with racing. Then Lightning McQueen hits the road and ends up in the middle of nowhere — this segment makes up the bulk of the running time. He meets some unlikely allies (including an old-timer) who help him learn a valuable lesson, which he takes with him to the big race at the end of the movie. A little too derivative? Yes. A bit too much nostalgia? Definitely. But despite the feeling that we’ve done this before — a joke even one of the characters in the film makes — there’s actually a fairly solid story. In this outing, Lightning is the elder statesman of the sport and has to not only deal with all the condescending comments about his age from some of the younger racers, but also the adoration from others that can sometimes make him feel even older. While some of his friends are talking about retirement, Lightning is ready to put the work in in order to keep up with the new competition. That’s where a new trainer — who knows the technical details of racing but not the realities of the road — comes in. I admit to being a little worried near the beginning of the film when we’re getting to see all the citizens from Radiator Springs again. While these characters were fun in the first film, they seemed more like excess baggage here. Luckily the writers did not feel the need to try to shoehorn them in too much. They all get an obligatory namecheck then are left in the dust once the plot starts moving again. The new characters here are much more of a better fit in the Cars universe than those from the second film. The new trainer, Cruz Ramirez, is a great foil for Lightning, whether teasing him, pushing him to do better, or learning from him herself. Sterling Silver, Lightning’s new patron, seems just as interested in branding opportunities as he is in racing victories. And Jackson Storm, the hot new rookie, is an extremely fun foe who, while not getting enough screen time, is always on the minds of the protagonists. These characters are tailor-made for this world which makes story opportunities almost write themselves. I don’t want to get too much further into the actual plot, other than to say it is very well put together. Unlike the original where we knew Lightning was eventually going to win, here the ending is in doubt to the audience. You’re not sure which way the writers are going to go with it. Sometimes that’s a curse for a filmmaker, as you have to make sure the audience will appreciate the ending you choose. So, you have to make sure you’ve set the pieces in place to earn that ending. Luckily the Cars 3 screenwriters kept their eyes on the road and got us where they wanted to go. Cars 3 is stunning visually. No surprise from the wizards in Emeryville. The artists are given a lot to work with: beautiful cross-country landscapes and fast-paced race scenes from every angle. The character design department gets a head start as well with a diverse cast of every type of vehicle you can imagine from every era of automotive history. If I could make any complaint it’d be that occasionally the animation is too good for a movie about talking cars with eyes for windshields! I was a little disappointed with the music. Randy Newman’s score never felt like a big part of any scene. And the pop music, while fun, wasn’t nearly as significant as the songs in the original. Neither issue brought down the film in any way. But after the more iconic soundtrack from the original, it was a let down not to even be able to even remember a note after the credits. The voice cast was pretty good. Owen Wilson as Lightning McQueen felt a bit off at the beginning of the film — a feeling that didn’t last so may have just been me. Cristela Alonzo as Cruz Ramirez was a lot of fun, but the voice didn’t really seem young enough for the character to my ears. That was never an problem, but just something that hit me a few times while watching. Nathan Fillion (in his second role for Pixar after playing Johnny Worthington in Monsters University) was spot on playing Sterling Silver. And Chris Cooper was fine, but a bit unmemorable, as Smokey. I don’t want to give this last one away as it’s a fun reveal, but of special note, I was sad to see the original voice actor didn’t return for this role, though Pixar writer Bob Peterson filled in nicely. Cars 3 is a little too similar to the original model for my liking. And it spends way too much time reminiscing. But most of the new stuff is very good, the writing is well done, and the animation is top of the line. 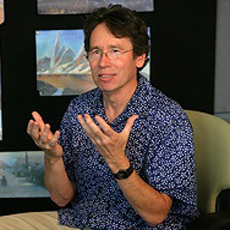 Thankfully, the Cars 3 filmmakers have put the rough roads of the past behind them and finished strong, manufacturing a film everyone in the family should enjoy.